I wrote this How To post last summer as a guest blogger for bornshoes and, with Zika in the news, thought you might like to see an unbranded, updated with tips, version of it. 47 days in the 90's…and counting…Summer been hot enough for you? It's been shorts and sandals season for months but what to do about those pesky mosquitos? Making homemade citronella candles part of your natural solution is as easy as 1-2-3. Melt-Pour-Light. OK, it's a little more complicated than that, but not much. Ready to make your own? Here's how. NOTE: You can use different sized jars, or even a metal container, for your candles. Just have one ounce of wax for every ounce your container will hold, and make sure it is no more than 3” in diameter. 1 Prepare the Wax: Melt the wax in a container that has a pouring spout, set in a pot of barely simmering water. Use low heat and caution: molten wax is highly flammable. Keep warm in the double boiler as you prepare the wick. TIP: The smaller the pieces of wax, the faster it will melt. 2 Prepare the Wick: For candles up to 3” in diameter, you’ll want to use a 2/0 square braided wick. It’s the best type for beeswax candles. Cut a piece about 1” longer than your container is high, and dip the whole length into the melted wax to “prime” it. Wipe off the excess then attach a wick tab to one end. Slip the other end of the wick between the chopsticks. Position the wick in the jar, sliding it up or down between the chopsticks so it is centered and straight. TIP: You can tie the wick around a skewer or pencil but the chopsticks make adjusting the wick so much easier. 3 Pour the Candle: Thoroughly stir 8 drops or so of the citronella oil into the hot wax. Pour just enough wax into the jar to cover the wick tab. Working quickly, use a skewer to adjust the wick’s position as necessary. Let harden to secure the position. Rewarm the pitcher of wax if necessary and pour to fill your container. Let harden undisturbed then trim the wick with scissors to about 1/4-inch. TIP: lay coffee filters or newspaper on your work surface for easy cleanup. To light the candle the first time, place a lighted match near the base of the wick. This will melt some wax that the wick can draw up for a good flame, strong enough to take on a summer breeze. A candle this size will burn for many hours. To extinguish it, you simply close the lid to snuff out the flame. Make sure to use tempered glass or metal containers for your candles, for fire safety. I used a vintage Le Parfait jar, available at Fante’s, a Philadelphia mecca for cooks since 1906. 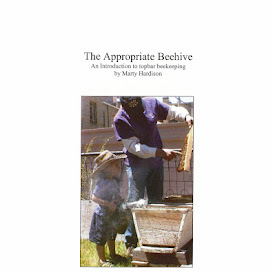 Since most of my readers are beekeepers, you'll likely be using your own harvested wax. Make sure to clean your wax as clean as clean can be. Wet process first to remove honey, then process again through an extremely fine filter to remove all impurities. Don't use cheesecloth. It will contribute cotton fibers that will cause your candles to sputter and smoke. Thanks for posting this! I've started making candles (just tea lights so far), but I've been wanting to make some larger candles because I've got so much wax. I don't want to make tapers because I don't like the mess they make when they drip & don't want to get into molds. This looks like a perfect project. You are so right about tapers @Julie D. Beeswax tapers drip like crazy! Or maybe the ones I've been given were made with an improperly sized wick. Beekeepers tend to "use what they have" but in the case of candle-making, that's not a great idea. Proper wicking is important. You are also right on about getting into molds… it is a slippery slope :) One on which your wallet falls out on the way down.